On the 21st April 2016 the Martin Maslin team will endeavour to bike 200 miles from our Abbey Walk base to Buckingham Palace without leaving the office!!! We have chosen to take on this task as part of our continued pledge to help those in our community who are suffering from the impact that cancer has on both the individual and their support team and will be donating all proceeds to MacMillan Cancer Support. We have chosen the date and the 200 mile virtual route to commemorate the 90th Birthday of Her Majesty Queen Elizabeth. 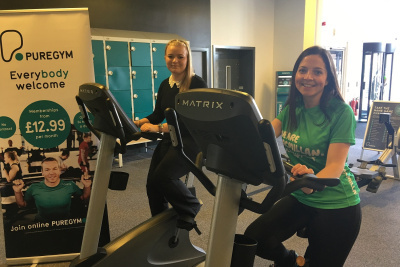 Over the course of 12 hours, 7.30am to 7.30pm, our team using two exercise bikes kindly donated by Pure Gym, will endeavour to cover the 200 mile route and hopefully raise a large amount of money for this superb charity. Any donations will be gladly received, please feel free to pop into our Abbey Walk offices and witness this ambitious attempt and chart our hourly progress on a large map as well enjoying a cup of tea or coffee.